market spotlight HEAD 1 Head 2 OCTOBER 2018 • FOODSERVICE EQUIPMENT & SUPPLIES • 81 R utter's Farm Stores, a c-store operator with 70 loca- tions in central Pennsylvania and West Virginia, has a longstanding history with foodservice. The chain bills itself as the oldest vertically integrated food company in the country with its roots in agriculture, which became a still-operating dairy operation and eventually added its first c-store in 1968. It's not an unfamiliar story among the strongest c-store foodservice innovators. Wawa has a similar tale with roots in the dairy business, and even the owners of Sheetz began its business by owning dairy stores. 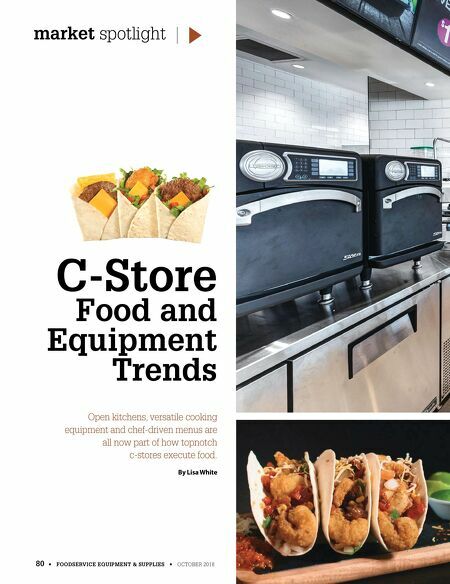 Fast forward to 2018 and c-store operators maintain a keen focus on the next generation of growth through food- service. "Over the last year or two, the convenience channel has begun to focus on made-to-order food, implementing differ- ent components to accommodate it, like touch-screen order- ing kiosks and bulk hot product," says Ryan Krebs, Rutter's director of foodservice. "Stores are looking beyond the roller grill and hot grill, but it's important to understand the c-store footprint's differentiation and the brand image." 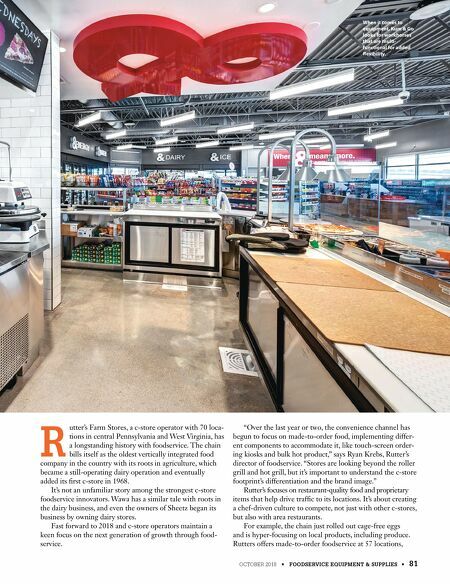 Rutter's focuses on restaurant-quality food and proprietary items that help drive traffic to its locations. It's about creating a chef-driven culture to compete, not just with other c-stores, but also with area restaurants. For example, the chain just rolled out cage-free eggs and is hyper-focusing on local products, including produce. Rutters offers made-to-order foodservice at 57 locations, When it comes to equipment, Kum & Go looks for workhorses that are multi- functional for added flexibility.